Carlsbad Caverns is the only well-known natural attraction of southeast New Mexico, a land of empty prairie crossed by a regular grid of straight roads, with just occasional hills rising above the level surroundings. The one major river in this part of the state is the Pecos, and as it flows past Roswell, the largest city in the area, the river forms a wide but shallow valley bordered to the east by a low limestone escarpment, at the foot of which is a series of small, deep, circular lakes. All were originally caves, or sinkholes, flooded by seepage from the underground water table, and exposed due to gradual erosion of the overlying rocks; they are contained within Bottomless Lakes State Park, the oldest such park in New Mexico (created 1933). The lakes can be seen from the park road or by short hikes, and although geologically significant they are perhaps not quite as interesting as might be imagined as the surrounding landscape is rather drab, dusty and featureless. Fishing is allowed in two (Cottonwood Lake, Devil's Inkwell), and swimming in one (Lea Lake, the largest), next to which is a campsite, pavilion and picnic area; recreation is the reason most people visit, but the lakes are good photographic subjects, and the place is easily reached, being just a few miles from the major cross-state highway US 380. The lakes have dark water and steep sides which led early explorers to think the depths were limitless, though they actually range from 17 feet to 90 feet. The Bottomless Lakes access road forks south of US 380, ten miles east of Roswell, and for 2.5 miles runs along the edge of the escarpment bordering the Pecos River valley, as far as a junction, at the start of a loop through the state park. One branch stays on top of the cliffs for another 4 miles while the other descends to the valley floor, passing close to all the lakes and the park facilities. The northernmost lake, the largest, and the only one on the west side of the road, is Lazy Lagoon, a large brackish pond which looks shallow and uninteresting but is actually formed by flooding of three adjacent sinkholes, the deepest 90 feet. The edges of the lake are muddy, the water bad smelling, and the surrounding earth is stained white from evaporated salts. The next four lakes are close together, within half a mile. 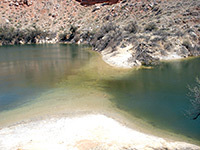 Cottonwood Lake is 30 feet deep, enclosed by sheer, unvegetated cliffs up to 80 feet high, formed of layered white/red rocks of the Artesia Group, a Permian-era mixture of limestone, sandstone and shale which makes up all the escarpment east of the Pecos River. Mirror Lake is the prettiest and most unusual in the park - two perfectly circular sinkholes separated by a narrow ridge just underwater, also mostly surrounded by cliffs, as is the next lake south (Devil's Inkwell), named for the particularly rich green/blue color of the water. Just beyond, Figure Eight Lake is another created by adjacent sinkholes, originally linked by shallow water but lowering of lake levels in recent years has left the two halves separated by a strip of sand. The cliffs become less high further south, so the next lake (Pasture) is surrounded by flat, bushy land, and is quite shallow (17 feet). 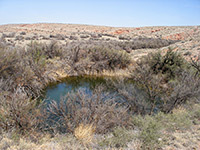 The small, unremarkable Lost Lake is the seventh, reached by a half mile walk through scrubland along a wide, level path that continues another half mile to Lea Lake, focal point for most activities in the state park; there may be several hundred people visiting on a hot day in summer, here for camping, swimming, sunbathing, scuba diving and picnicking. 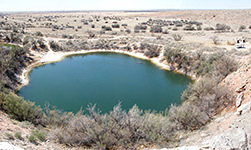 The lake covers three sinkholes, deepest 90 feet, and has a long sandy beach around one side. The ninth and final lake (Dimmitt) lies just outside the park boundary, and is owned by a local fishing club. This is another large pool, edged on the south side by vertical, 100 foot cliffs. Twelve miles from the lakes, Roswell has a good selection of hotels.